Gosh I love when somebody takes my ideas and runs with them (pun alert) to grow their business. I recently caught up with Rebekah (Bek) Keat of Team Sirius Tri Club to learn about how she uses online content and social media to reach beginner and weekend warrior triathletes who want to know basic information. This approach to marketing by targeting a specific buyer persona has led to Team Sirius Tri Club growing from just 4 athletes to 240 in just under two years. Bek worked hard to create a buyer persona profile for the beginner triathlete and then use that as her guide to creating the content that will attract them. Her research showed that people new to triathlon had very basic questions about the sport, training, and gear but were often embarrassed to ask. Things like how to sight in an open water swim. I interviewed Bek on the stage at the Tony Robbins Business Mastery seminar in Las Vegas in August and we shot this short video while there. Prior to becoming a coach, Bek Keat enjoyed tremendous success as a triathlete. She raced triathlons at the elite level for 15 years and is a 2-time Junior World Champion, 3-time Australian Ironman Distance Champion, and 6-time Iron Distance Champion. When Bek retired as a professional athlete in 2016 she had no income! In early 2017 she turned to coaching and started with just 4 athletes. She was nervous about the business but was eager to learn marketing. While I helped, Bek did all the hard work. She realized that she needed to stand out from other Triathlon clubs that work virtually with athletes so she focused on creating a program for beginner triathletes and the “weekend warriors” who compete at the amateur level. Go Bek! 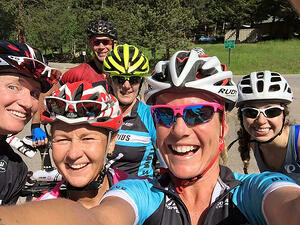 #1 female coached Tri Club in the world! Bek’s Team Sirius Tri Club Facebook page has 50,000 likes, her @rebekahkeat Twitter over 10,000 followers and she also hosts a members-only page on Facebook for the team. On her social channels she also shares personal information including her passion for rescuing horses and the beautiful location in Boulder, Colorado where she trains elite triathletes. This glimpse into Bek's personal life helps people to understand more about her and what it might be like to work with her as a coach. Most people separate business and personal on social media and I think that's a mistake. A fun aspect of social media is getting to know a bit about the personal lives of those we do business with. Now with 240 Members, Team Sirius Tri Club is ranked the #2 Tri Club in USA, #5 Tri Club in World and the #1 female coached Tri Club out of over 2,000 clubs worldwide! 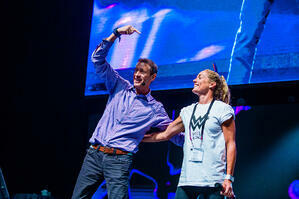 Me and Bek onstage at Tony Robbins Business Mastery by the super talented Milla Kuhto.